Injuries, particularly musculoskeletal disorders, are common in the restaurant and hotel industries. People who work in these industries are often on their feet all day or all night. The National Institute of Health has found that hotel workers sustain higher rates of occupational illness and injury than others in the service industries. If you are a restaurant or hotel employee in Boston and you suffer an accident on the job, the experienced workers’ compensation attorneys at Pulgini & Norton may be able to help. Slip and falls, sprains and strains, and back injuries are common in the service industries. 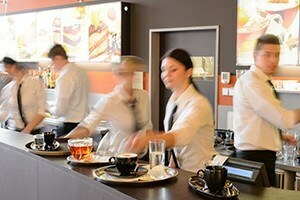 Shift work, which is what most restaurant and hotels use, also has a higher risk of harm. The Department of Industrial Accidents (DIA) administers the workers' compensation system, including an administrative court to hear these claims. In some cases, insurers accept liability and pay out the appropriate benefits, but in many cases, workers are required to file claims with the DIA and go through some of the five stages of appeals in order to prove a case and try to recover benefits. Among the benefits you may be able to recover are permanent and total disability benefits, partial disability benefits, temporary and total disability benefits, medical benefits, lost earning capacity, and disfigurement benefits (also available for scars and loss of function). Sometimes injuries are severe enough to stop restaurant or hotel employees from working, but they would be able to work in another capacity or in another industry. There is an Office of Education and Vocational Rehabilitation (OEVR) at the DIA, which assists injured workers in returning to meaningful employment. In order to be eligible for rehabilitation benefits, an injured worker would need to have residual restrictions because of a job-related injury that stops him or her from going back to the same job. The purpose of the vocational rehabilitation services is to return the employee to a pre-injury average weekly wage. The right to vocational rehabilitation is limited. OEVR will screen injured workers to decide whether they are suitable for vocational rehabilitation, and only someone who could return to the work force in a job that paid the same average wage that he or she earned previously will be accepted. An individual plan is created for the worker. Part of the plan will include a plan for a job search in jobs that might pay a comparable wage, and if this fails, the worker will have to look at the open labor market. If this fails, the worker may be eligible for retraining, although this is not guaranteed. A worker may be eligible for retraining if he or she can complete the retraining program within two years and get employed at a comparable wage. If these requirements are not met, it is unlikely that retraining will be offered. If you are a restaurant or hotel worker who has suffered a workplace accident in the Boston area, you may want to enlist a lawyer in your pursuit of workers' compensation benefits. The attorneys at Pulgini & Norton can assist residents of Brookline, Lowell, Malden, and other Massachusetts cities. Call us at 781-843-2200 or contact us via our online form for a free consultation.